Using one generic item to represent miscellaneous purchased items is a common thing and I believe it is a smart thing to do in some cases. Some companies buy a lot of different items one time based on customer requests. With many people in an organization purchasing these items you still want to have strickt controll over your product registry. Using these items make sence. However making sure your costing is correct is important. You can do this by marking your purchase to your sales orders or BOM lines. This is tedious work and some might slip through the cracks, falling back on your costing principle to take controll resulting in some serious costing issues. A smart way to get this correct every of the time and use tracking dimensions that are financial stock active. In this example we use serial number. This example is has one serial number created for each, but also has information about receipt date and lotID. Serial numbers are normally used 1:1. I don’t use the controll since the number group determin the serial number creation. Remember that you can use batch numbers to group receipts together and give them a common tracking ID. In that case you don’t have/want to use the number sequence on the tracking dimension group. You can configure the rest of the item at your own accord. After receipt on a purchase order with a quantity of 5, the serial numbers are automatically created. You can create a label that is printed at receipt to mark your items with a barcode. This barcode can be used when picking the item to identify it. 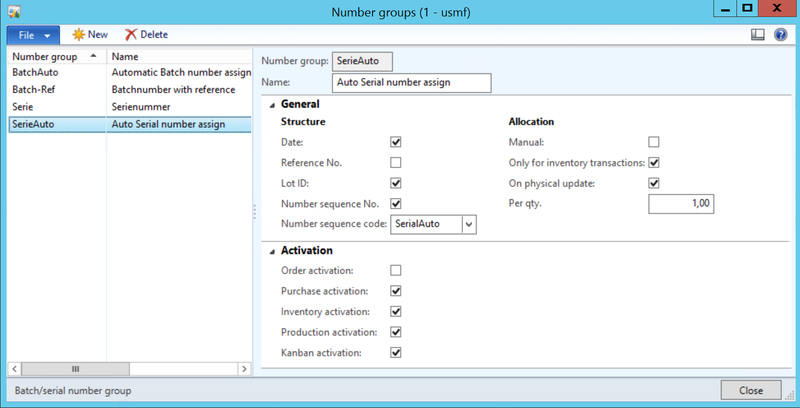 Now when creating a sales order or production picking, you would be required to select one of these serial numbers effectively connecting the purchase order to the sales order and also the correct price. So even if you have a miscellaneous item you would still be sure that the cost is correct. So instead of being required to mark the purchase order to the inventory issue, this is now automtically handled through the inventory process.